BANGI, 12 March 2014 – The mind-set of the world often sees certain jobs are only suited for women and this gender segmentation is especially true to migrant workers who cross borders in the millions to work. Globalisation has also contributed to the increase of migrant workers especially women who have doubled in number since the late 1980’s. A lecturer at the Department of Sociology in the Faculty of Social Sciences, Hosei University, Tokyo, Japan, Dr Mako Yoshimura said they are usually hired as domestic helpers, nurses, care givers, nannies and entertainers. She described this as the “Feminisation of migration” in a talk at the Tun Fatimah Hashim Women Centre for Leadership on “Gender and Migration: Perspective in Globalised Asia”. Dr Yoshimura sees the ever “feminine” specificity of female migrant workers in certain types of jobs. The major sending nations of migrant workers are the Philippines and Indonesia while the major receiving countries in Asia are Malaysia and Japan. While the male migrant workers are normally seen in construction sites, factories and even as security guards, these are jobs that are considered “masculine” in its essence. The female migrant workers are mostly seen as live-in maids in family households and caregivers for the elderly. Although, in recent years, there have been some female workers at construction sites, they are few and far between. “Even in the factories in Malaysia, even though there are plenty of female migrant workers there, it is somehow embedded that working in a factory is a male oriented job, which is not really true,” Dr Yoshimura said. She said it is not just the mind-set of Asia, but the world in general, for when they think of maid, nanny or nurse, they immediately think, women. Director of the Tun Fatimah Hashim Women’s Leadership Centre, Assoc Prof Dr Madeline Berma agreed that the “feminization” phenomena does not apply only to countries in Asia but also around the world. “I think it is more than a cultural thing, it something we are used to in our daily lives. It is history mixed with culture, tradition and even pop culture – because we accept the normal image of a doctor is a man, nurses are women, men are engineers, women are teachers. These are socially accepted portrayal of gender. Add to that with TV and films constantly giving a cliché gender position portrayal, that becomes embedded in people’s psyche,” Dr Madeline said. As the world becomes more of a globalised neighbourhood, a Malaysian engineer working in Dubai is no longer strange. Dr Yoshimura conceded that even the professional trade are in need of new and fresh talent and the borders now seem so trivial that being an expatriate is now considered normal. However, the increase of migrant workers in the past decade is huge estimated at between 200 to 300 million workers crossing borders all over the world. Whether through legal or illegal mean, they have made other countries their home away from home to make a living. Migrant workers from Bangladesh, Sri Lanka, Thailand, Indonesia, Philippines and Cambodia have filled in the service, manufacturing, constructing and plantation sectors of Malaysia’s economy. 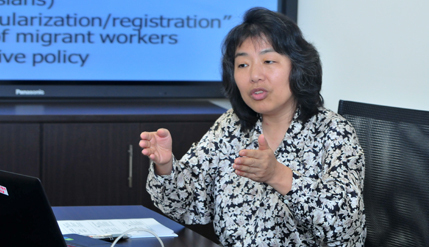 Dr Yoshimura said that the migrant workers usually take up jobs that the Malaysians do not want. “The Malaysian economy itself is largely dependent on migrant labour as Malaysian youths are not interested in the blue-collar jobs that require hard labour with small pay. Most of them go to universities and graduate, why would they want to work in the construction sector when they can get work in an air conditioned office. Dr Madeline agreed that although the salary for a domestic helper has increased to be on par with what a secretary earns, no Malaysian girls would want to go job hunting to be a maid. She adds that the gender segmentation of migrant labour is not a reflection of the workers themselves but rather the reflection of society as a whole. The automatic assumption that a nurse has to be a woman, is very sexist, considering the number of male nurses have grown exponentially. Dr Madeline said there is also need for male nurses for example to carry patients who are paralysed or in a coma.